The Cat three-wheeled electric forklifts are distinguished by their quiet and nimble operation, large battery capacities and ability to conserve and regenerate electricity, according to United Forklift and Access Solutions. 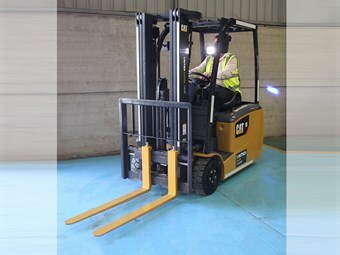 One of Cat's EP-TCB series electric three-wheeled forklifts. The versatile Cat lift trucks are available in capacities from 1.3 tonnes to 2 tonnes and can handle a wide range of unit loads including pallets, pallet boxes and stillage cages. "The advanced green AC power of the EP-TCB series trucks cuts emissions while giving greater performance, longer shift cycles and simpler maintenance," United Cat product manager Craig Coles says. "They have some of the largest battery capacities in the market, with 20 per cent greater power reserves enabling them to work harder for longer. "Additionally, the versatile configurations of CAT electric trucks and their easily programmable operating characteristics let operators match machine performance with operator experience and load type in virtually any interior task and for many outside uses too," Coles says. Power levels can be configured to best suit the lifting task at hand, he adds. The EP-TCB series’ advanced AC Energy Regeneration System conserves and regenerates energy by channeling power back into the battery during simple activities like braking, plugging and decelerating. Further energy conservation is achieved by the automatic shutdown of the forklifts after 15 minutes when left in standby mode. The Cat AC Power Control System and high-capacity motors provide powerful acceleration even on an upslope, Coles says, while the advanced electronics enable very precise inching and control. In the warehouse, the latest CAT electric forklift trucks are quick and easy to manoeuvre, with very tight turning circles complemented by rounded rear surfaces to enhance manoeuvrability and minimise collision and damage risks in confined spaces. Coles says their typical maximum lift height of 7.5m makes them well suited to most standard wide aisle racking operations, while their clean operation makes them particularly suited to food, beverage, pharmaceutical and sensitive and refrigerated goods handling. "For production environments, electric forklifts are perfectly suited to bringing supplies or components to a production line or clearing waste packaging or other production by-products away," he says. "They can additionally be used to load or unload heavy goods vehicles, either from the rear of the vehicle via a raised loading dock or from the side, from ground level." On the safety side, the Cat Lift Trucks ‘Mast and Travel Interlock System’ helps protect operators by initiating a series of protective actions if operators leave the normal seated operating position. Click here to find Cat forklifts for sale. 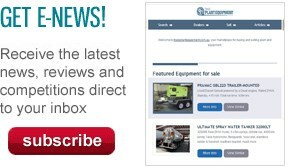 Click here to look up electric forklift specifications.